Last month we had a look, and hopefully a listen, both to the planets visible in the night sky and to those same planets featured in Gustav Holst’s The Planets. This month, we finish off the night sky and the musical movements (except for Pluto, which wasn’t a planet when Holst composed his piece, and isn’t a planet anymore). JUPITER, which was visible the last two months, is almost completely swallowed up in the glare of the just-set sun now. The planet is just above the horizon and almost impossible to spot, although on February 16th it appeared to be next to the planet VENUS, a “conjunction,” and the two planets gave the optical illusion of appearing to pass one another while going in opposite directions. While they didn’t literally pass by one another, they are moving in opposite directions across the sky. Jupiter will vanish from our evening skies soon, only to reemerge as a pre-dawn planet later in the spring. Venus, on the other hand, appears to be slowly climbing higher into the sky each night after sunset. As February ends and March begins, Venus will be brighter and higher each night, but it’s still a hard planet to spot. 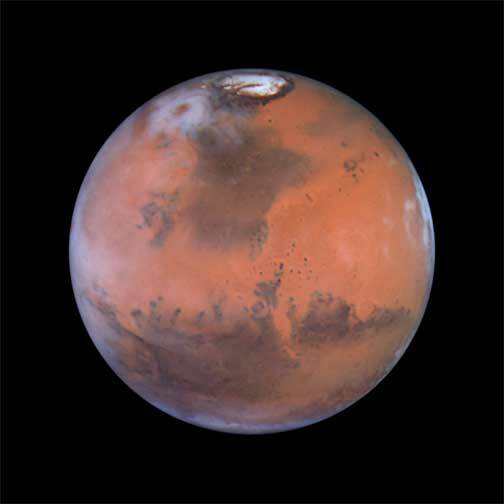 The planet MARS is well up in the northeast at sunset, high overhead by midnight, and setting in the west (if you happen to be up before dawn) by night’s end. Look for it now, though, while Mars still is bright. Its brightness will quickly fade during March as the earth’s smaller, swifter orbit pulls away from the planet. Next to be seen is the planet SATURN. At this time of year, Saturn is passing “through,” or in front of, the constellation Virgo. Virgo is a large constellation, but not as easily spotted as some others like Leo, the Lion (immediately to the right, or west, of Virgo), or Scorpio, the Scorpion (low to the left, or east, and with faint Libra between it and Virgo). Leo and Scorpio have distinctive shapes, especially Scorpio. Virgo…well, it just sort of sprawls above the southern horizon, as seen from the Northern Hemisphere. It is the largest of the Zodiacal constellations and Saturn, a slow mover, will be “in” Virgo for a long time. Saturn’s most famous feature is its rings. For many years, scientists thought it was the only planet that had rings, but we now know that the three other “gas giants” of our Solar System: Jupiter, Uranus, and Neptune, also have rings. While Saturn’s rings ordinarily make for a spectacular sight, we’re out of luck for the next few years. During each of Saturn’s orbits around the sun (approximately 29.5 of our years), there are times when our view of its rings is edge-on, making them largely disappear from view. Sadly, the rings won’t be really visible for another few years. These nights, Saturn looks like a golden-colored star in western Virgo, somewhat below the “tail” of Leo. It will rise in the southeast at about 7:30 PM by the end of February, and then will rise progressively earlier each night after that. The difference is hard to notice, but it adds up to a 2-hour change during a month, and by the end of March, Saturn will rise at 5:30 (6:30, Daylight Savings Time, by then). In The Planets, Saturn is “The Bringer of Old Age.” This title makes sense, for one of the names the ancient peoples gave the planet Saturn was “Chronos,” or Time. Of the visible planets, Saturn is the most distant from the sun and seems to move the slowest of all, taking almost 30 years to make one revolution around the sun. A quiet and slow musical tick-tock marks the passage of time as the movement “Saturn” opens. The music has almost a heartless and indifferent quality to it as it slowly and steadily counts off “…the Days of Our Lives”, as the announcer for the soap opera used to say. This tick-tock suddenly ends as a slow procession begins in the trombones. Then, the flutes that were so cool and peaceful flutes in “Venus” appear again. It’s hard to imagine any sort of flute sound as being menacing, but that’s exactly what happens here as the flutes slowly and inexorably come closer…and closer. Chimes sounding like a clock striking the hour give something close to a feeling of despair, but the music ends peacefully, with a resignation that nevertheless isn’t devoid of hope. Finally, the planet MERCURY. Mercury is closest to the sun of all the planets, and so can only been seen from earth for a short time before sunrise or after sunset. Right now, Mercury is too close to the rising sun to be easily spotted, but later in springtime it will be visible briefly above the sunset. We’ll talk more about Mercury in a later blog post. “Mercury, the Winged Messenger” is the third (and shortest) movement of The Planets. Where “Mars” was relentless and “Venus” placid, “Mercury” is a masterpiece of musical restlessness. The element Mercury often is called “Quicksilver,” and the music matches this quality well: darting, swooping, dancing, and never staying in one place for long. In fact, at one point in the movement, Holst gives the instruction senza misura – “without a measure” – meaning that for a time there is no sense of rhythmic pulse or beat, but just notes scurrying about gaily. A short burst of a quiet chord, almost like seeing distant fireworks, ends the movement. And that brings an end to this examination of both planets and The Planets. As mentioned before, the music is easily found online and elsewhere, and is one of several works that, for musicians and non-musicians alike, is unforgettable after first being heard. I hope you’ll enjoy both the planets and The Planets. As always, good seeing (and listening)! Thanks to amazing new pictures from the High Resolution Imaging Science Experiment (HiRISE) camera mounted on NASA’s Mars Reconnaissance Orbiter, you can imagine that you’re pressing your nose to the window of a plane flying over the Red Planet: cruising Mars from the comfort of your chair. The camera is operated by the University of Arizona, Tucson, and is part of NASA’s Mars Reconnaissance Orbiter (MRO) mission. The MRO was launched August 12, 2005, and is searching for evidence that water persisted on the surface of Mars for a long period of time. Scientific instruments aboard the MRO are zooming in for extreme close-up photography of the martian surface, analyzing minerals, looking for subsurface water, tracing how much dust and water are distributed in the atmosphere, and monitoring daily global weather. The HiRISE camera is the largest ever flown on a planetary mission. This camera is capable of showing objects as small as three feet across — the size of your dining room table!